Experimental Artists live to explore new techniques. Sometimes its important that we approach and art experiment without any preconceptions of what we want to create. 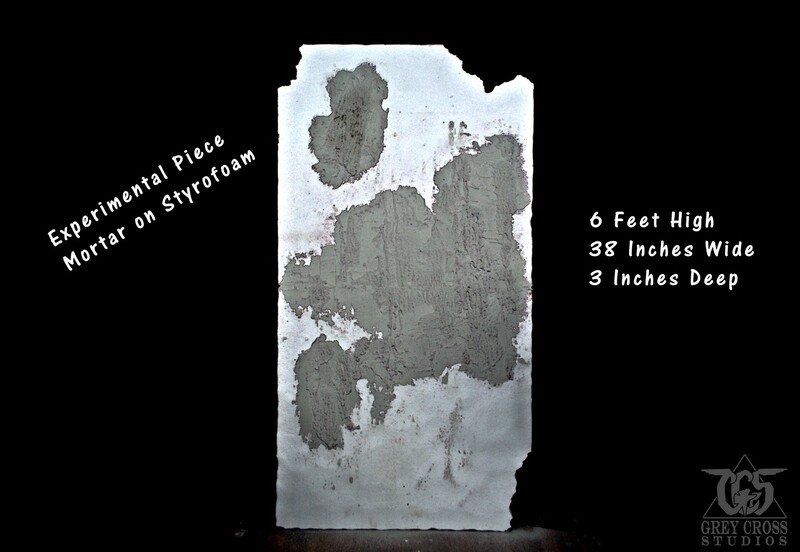 The experiment above began with only one goal, to see how mortar reacts to styrofoam. I'm coming at it from the idea of creating a surface that has multiple dimensions. 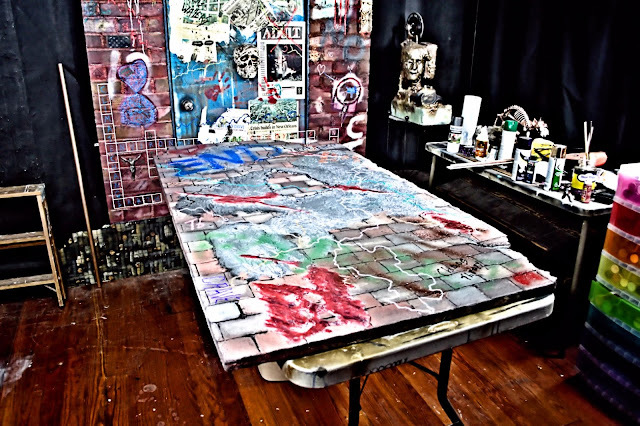 Using very wet mortar, I spread it out in random spots along a 6 foot styrofoam panel. Before I began, I used a heat gun across the whole surface of the styrofoam in order to strengthen it. When Styrofoam is heated it becomes much harder than the original substance. My idea was that the mortar might not adhere to the styrofoam if it wasn't prepped first. It needed a more solid surface that it could seal into. The mortar was laid out randomly and then I used a simple rolling pin to spread it out a bit. It was left over night to dry with a fan on it. As I had hoped the dried mortar was sealed tightly to the styrofoam the following morning. I then used the heat gun to further melt the styrofoam around the mortar, creating more depth as the foam sank. The mortar was left raised. Lastly I used a piece of sand paper to clean up any pieces of mortar sticking up and clean the surface a bit. Thats as far as I've taken it so far. The experiment isn't over but I want to consider the next step carefully and how I can put the experiment to use as an actual art form. I've said often that the greatest benefit of styrofoam is that can create depth that you cannot achieve easily on canvas. Any good art experiment means that you take time to observe and to consider each step carefully. So from this point on its about improvisation and taking the experiment to the next level. This experiment has been vexing. Some things have worked, others haven't. When all is said and done though, I came up with a conceptual idea that might make all the experimenting worth it. Here is how the piece looks at the moment. You can see its changed pretty dramatically since it started. At first I wanted to steer clear of just another wall, but as I worked at the piece I realized that the brick serve another purpose. They allow me to use it much like a piece of graph paper. I can lay things out on it before actually creating it. I'll go into this more later. But for now the bricks were a necessary part of the experiment. 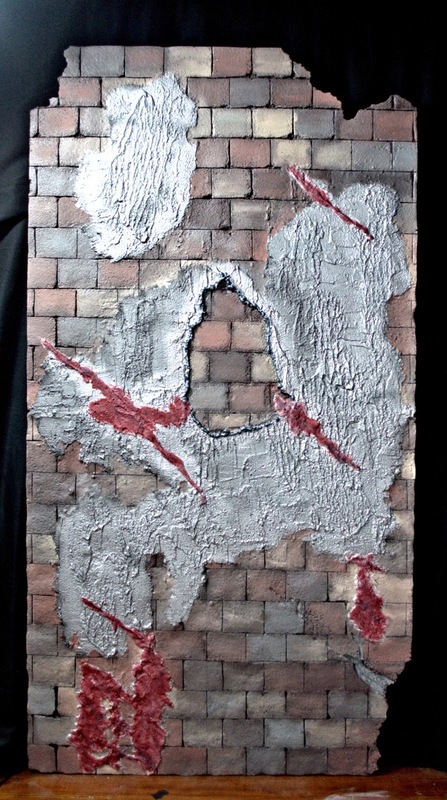 I also experimented here with an additional layer of mortar (the red areas). I wanted to create a greater depth to the piece. The center point where the wall is seen was the result of an experiment gone bad. I used natural clay over the mortar to see if I could work designs into the clay. But after the clay dried, it began to curve up and pulled the mortar away from the styrofoam. So i ripped the whole thing out and used a foaming glue around the edges to re-secure the mortar. But I actually think I like it better this way. Here the piece is taking on a lot of new meaning as the graffiti is added as part of the underlayer for larger painting that will be added later. I'm very pleased with it right now.